Fully encapsulated Level A suit that provides one of the broadest ranges of chemical protection available. This DuPontTychem 10000 (formerly DuPont Tychem TK) Level A suit has successfully tested against more than 322 chemicals. This Level A PPE suit has either front or rear entry options. Tychem 10000 has excellent chemical barrier properties and offers an extremely durable fabric that is puncture- and tear-resistant. Tychem 10000 fabric shows at least 30 minutes of barrier protection to 322 challenge chemicals with no observed breakthrough. Tychem 10000 is specifically developed for protection against toxic, corrosive gases, liquids and solid chemicals. This high-performance chemical barrier fabric is suited for industrial, HazMat, and domestic preparedness applications. 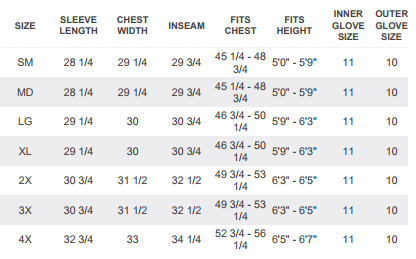 Each Level A suit has a unique serial number and is fully tested at time of manufacture including positive air pressure integrity testing per ASTM F1052. Two Pirelli® style exhaust valves release higher pressure inside encapsulating garments while simultaneously helping to prevent inward leakage of external vapors or particles into the garment. External splash covers help protect valves from liquid intrusion. No valve shelf-life limits. Level A Suit Return Policy: Fully encapsulated suits are made-to-order by the manufacturer. Orders for fully encapsulated suits cannot be cancelled or returned and may require prepayment at the time of order.